For every 100 shares of Fortis held, a shareholder will receive 10.83 shares in Manipal Hospitals, the combined company that will be created, Fortis said. Fortis Healthcare Ltd said on Tuesday it would sell its hospital business to Manipal Hospitals Enterprises Private Ltd, creating the largest provider of healthcare services in India by revenue. 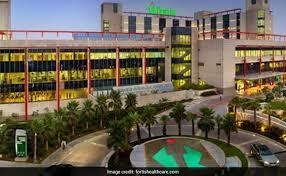 Fortis, based in Gurugram, also said it approved the sale of a 20 percent stake in diagnostics chain SRL Ltd to Manipal Hospitals, providing Fortis with more than 7 billion rupees. Manipal Hospitals will be a publicly traded company listed on the National Stock Exchange and the Bombay Stock Exchange, while remaining businesses with Fortis Healthcare will be an investment holding company with 36.6 percent stake in SRL, Fortis said. Dr. Ranjan Pai and U.S.-based private equity firm TPG Capital, a shareholder in Manipal Hospitals since 2015, will invest 39 billion rupees in Manipal Hospitals, to finance the acquisition of 50.9 percent stake in SRL. Manipal Hospitals is in discussions to buy 30.9 percent held by other investors in the diagnostics chain. The investment will also support the proposed acquisition of hospital assets owned by RHT Health Trust and the growth of the hospitals and the diagnostics businesses, Fortis said. Fortis' main backers, Malvinder Singh and Shivinder Singh, resigned from its board last month following legal troubles related to the sale of their stake in Ranbaxy to Japan's Daiichi Sankyo Co Ltd. The Ranbaxy case is unrelated to Fortis. "We continue to support the management and the board to successfully transition to the new joint entity," the Singh brothers said in a statement late Tuesday.